Space books and science fiction put the depths of space in the palm of your hand. See Space.com’s latest space and science fiction book coverage here. 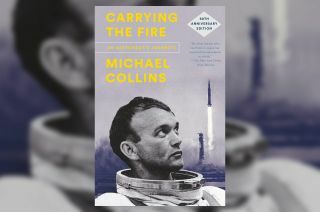 A detail on the front of author James Donovan's latest release, "Shoot for the Moon," is likely to attract the interest of space history enthusiasts: the endorsement of astronaut Michael Collins. The most dangerous thing in space exploration is the humans that do the exploring — right up until it isn't. This excerpt from Chapter 16 of Rod Pyle's new book "Interplanetary Robots" details the history of the probes that have braved the crushing pressure and fearsome heat of the planet Venus. After just two weeks in space, it looks like rookie Canadian astronaut David Saint-Jacques is feeling really comfortable in microgravity. Space.com's editors present a list of the astrophysics and astronomy books worth a read-through. Getting excited about NASA's InSight lander touching down on Mars? We are, too! Here are some of the best books for young and old to read up about the Red Planet. James Carter would be the first to admit that he is a children's book writer, not a scientist. Here are the some of the science fiction books Space.com's writers and editors have read and loved. With the space-tourism industry getting ready to take flight, aspiring space adventurers will soon be able to purchase tickets to low Earth orbit and beyond. In the opening pages of Mary Robinette Kowal's novel, "The Calculating Stars," an asteroid slams into the ocean near Washington, D.C., wiping out the federal government of 1952. Here are Space.com writers' and editors' picks for photo collections and astrophotography books that will transport you to other worlds. In Kim Stanley Robinson's new novel, "Red Moon" (Orbit, 2018), readers launch 30 years into the future and follow the lives of humans living and working on the moon. In his final book, released Oct. 16, Stephen Hawking tackles big questions about the universe, delving into physics, cosmology, the existence of God and the future direction of humanity. In "I Am Neil Armstrong," a new children's book detailing Armstrong's life, author Brad Meltzer shows readers how an eager young tree climber got all the way to the moon. "Explorer Academy," a new seven-book book series from National Geographic, combines real-life science and exploration with fiction to captivate young audiences looking for adventure.